Norman "Sailor Jerry" Collins at work. During World War II, thousands of enlisted American men embanked in Hawaii, and a tattoo artist named Norman Collins got his ink on more than a few of them. Better known as Sailor Jerry, the tatter has gained a kind of cult worship now in the body art world and beyond (witness the lifestyle brand in his image) largely due to his inked designs which commingled Eastern influences (nods to the techniques and finesse of Japanese tattoo masters) with Western (all-American, I-heart-mom-and-the-flag motifs). 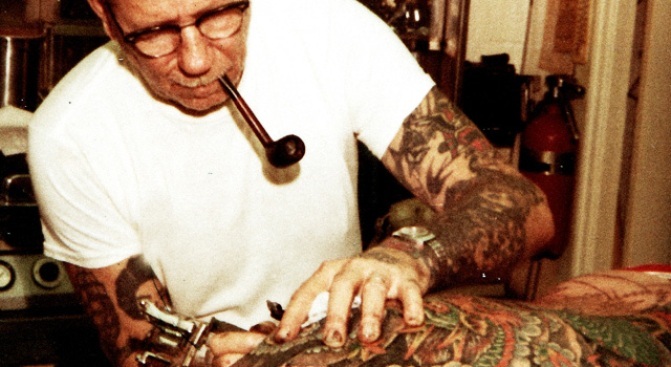 The feature length documentary Hori Smoku Sailor Jerry digs into this iconoclast’s life and influence on body art as we know it, and as such is something of a primer on the roots of American tattooing (plus, culty figures like Ed Hardy cameo) . After scooping up accolades at a bevy of fests from Philadelphia to SXSW, the film from music video-vet Erich Weiss (John Legend, the Buzzcocks) screens tonight at Tribeca Cinemas at 7PM. More information on the screening here; learn more about the movie at horismokumovie.com.